I was delighted to attend the “Decent Work and Climate Justice” event during the UN Climate Conference in Bonn to hear environmentalists and trade unionists working out their shared agenda for a Just Transition to a low carbon economy. 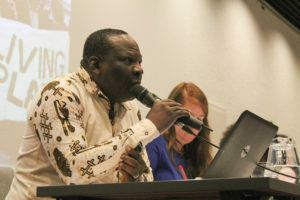 It was organised by the International Trade Union Congress (ITUC) and Friends of the Earth International (FoEI) and explored the different imperatives which are bringing them together around the core values of justice and people power. 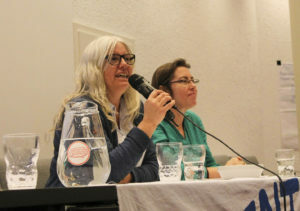 Karin Nansen (FOEI chair) opened the meeting speaking about the need for justice and for system change, recognising that “we are fighting a system which turns energy into a commodity, for profit; whereas we want a publicly-owned system under social control”. She said that “justice requires that the working class should not pay for this necessary transition with losses of jobs, rights and conditions”. Donald Pols of Miliedefensie (Friends of the Earth Netherlands) picked up this theme highlighting the unequal distribution of costs of tackling climate change in his country – households pay more than they contribute, business pays less. “People on lower income contribute a three times larger share of their income than those with higher income. The transition will only be successful if all society participates and it takes everyone along. There are currently 80,000 jobs in fossil fuels, while clean energy can create 110,000.” He thought the Dutch Government’s approach so far had been characterized by an import of technology and export of jobs. It is clear that this work is as much an economic as an environmental agenda. Aware that on some issues Unions and environmentalists may have positions which can on the surface appear to be in conflict, the shared territory of Just Transition provided the framing within which a wider platform of shared values and priorities is being forged. This is driven by acceptance of the urgent need to control the transformation of our economies in order to protect the natural world on which all our lives and all our jobs ultimately depend. One of the main themes to emerge was the need to challenge corporate power and corporate capture of water, land and food systems. Godwin Ojo of FoE Nigeria spoke of the need to shift subsidies from fossil fuels to renewables; and at the same time to protect workers’ rights to decent jobs as we change from dirty energy to renewables. However, in the wrong corporate hands, renewables can be damaging to the environment, believed Hemantha Withanage, citing the example of hydro power schemes in his home country of Sri Lanka. Other contributors emphasized the importance of reducing levels of energy consumption instead of promoting renewables which displace people or damage the environment. Whilst some renewables projects had created conflicts in some sites, the Greener Jobs Alliance in the UK is promoting public investment in green energy; and seeks to move from dialogue with trade unions to speaking to those members affected by the transition. Sean Sweeney of Trade Unions for Energy Democracy went further and explained why public ownership is back on the agenda; renewables don’t offer a sufficiently attractive investment opportunity for large multinationals. The pace of private investment is too slow for the scale of change needed to the address climate emergency. Monica Atkins (It Takes Roots) sought to remind us that the challenge was bigger than just energy jobs, describing how their Just Transition work in Mississippi means zero emissions vehicles, mass public education and food growing. The event heard of some of the practical steps towards taking this agenda forwards. Lance McCullen, Australian Congress of Trade Unions, spoke about the Latrobe Valley Worker Transfer Agreement. This involved A$220m from the state government and contracts which resulted in workers from a closing coal power plant being transferred to other power plants; and new jobs for 150 displaced workers. It was also supported by broader public investment in the area affected to help replace the jobs lost from the local economy. Mary Church of FoE Scotland explained how they had set up a Just Transition Partnership with the Scottish Trade Union Congress and 10 months later the Scottish Government announced it would set up a Just Transition Commission. The loss of jobs in North Sea oil and gas created opportunities to talk to unions about what can replace them. In the past, failure to create local supply chains for onshore wind in Scotland meant that many of the employment benefits have gone to other countries where wind turbines are manufactured. So the focus in Scotland is on industrial policy and the direction of economic development. Moving from principles to practice, there is starting to be a focus on articulation of these messages about Just Transition in ways which makes them accessible and popular with not just trade unionists and environmentalists but all people’s movements – and can build greater strength against neo-liberalism and the dominance of the rules of the markets, profit and capital accumulation. 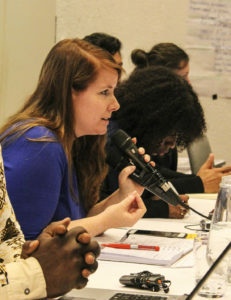 Returning to the theme of system change, Bridget Burns of Women’s Environment Development Organisation said “we can’t talk about system change without talking about dismantling patriarchy; we are fighting an economic model which exploits people and the planet and we need gender-just solutions and a just transition of the workforce too”. 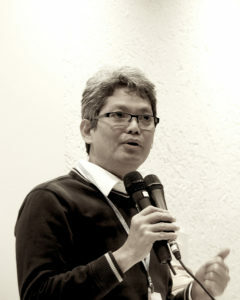 Josua Mata from Philippines said that we can’t stop climate change without changing the system; and we can’t change the system without working together. “We are fighting against the same companies for different reasons. They want discord between us pitting ‘jobs against the environment’, so that’s why we work with environmental organisations” said Lance McCullen of ACTU. This was an inspirational moment at which one could glimpse the strength of an alliance for economic, environmental and social justice which, with these two movements at its core, can change the world. The representatives of both of these movements met in a spirit of respect for the struggles of the other and the knowledge and wisdom which they have built up; and of the dialogue we now share. 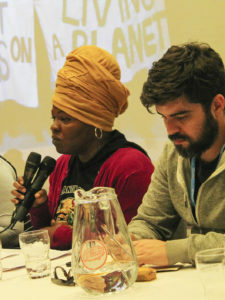 This event took place during the Bonn climate talks on 12 November 2017.